In the two weeks preceding every major Apple product launch, the buy-back companies start circling, trying to convince you to sell your old iPhones and iPads to them instead of the competition. This year’s iPhone 5S and 5C launch is no exception, and even Apple is rumored to be starting a buy-back program. Gazelle is one of the oldest “recyclers” of used iOS devices, and we have recommended the service before. This year, though, their service is getting even better, because they are allowing now offering a price-lock guarantee. What does that mean? Every year, there’s a sweet spot between 15 and 30 days before an Apple event for selling your old iDevice. It’s natural to want to wait to see what Apple announces on stage, but the closer you get to Apple’s launch event, the less your old iPhone will be worth. What Gazelle is offering is a way to lock your buyback price in before Apple’s September 10th iPhone event, guaranteeing yourself the best deal on your old iPhone possible. Then you have until October 15th to actually mail the iPhone to Gazelle. If they don’t get your iPhone by then? You don’t get any cash. If you intend on selling your old iPhone before the new one arrives, this is a good deal. 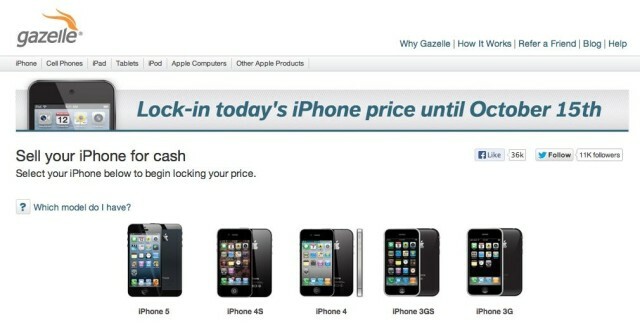 Not only do you lock-in the best possible deal for your old iPhone, but you don’t have to sell Gazelle your iPhone before you get your new one. Sounds like a win to me.